Slow oven drying makes this prefectly dried cherry tomatoes, i prepared mine during the night time when the electric change is very less when compared to the day time. This oven drying needs almost 3hours, but still its worth for me to try as a bottle of sun dried tomatoes which costs almost 4-5euros here. The best part of making this oven dried tomatoes at home is you get your own bottle of dried tomatoes without any preserves. This doesnt have any price rite. 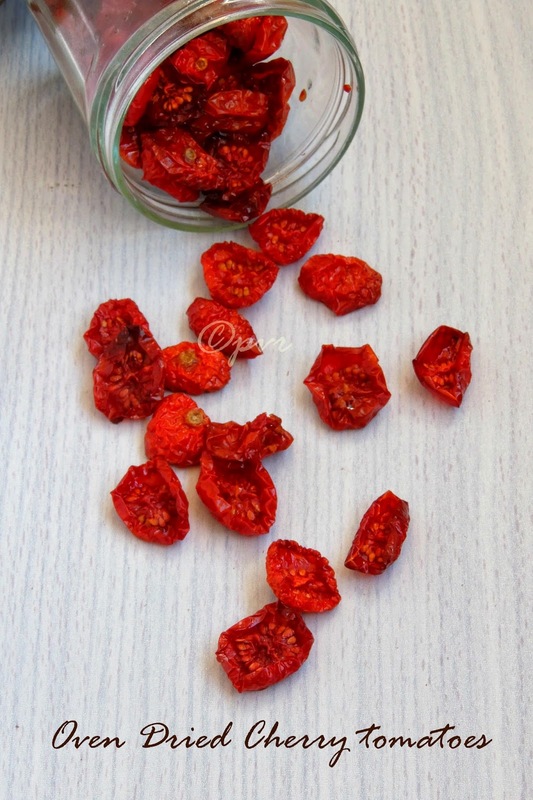 Am waiting to make pesto with this dried tomatoes. I stored them with few sprigs of rosemary leaves, as i want to get rosemary infused oil to drizzle over my pastas or pizzas. 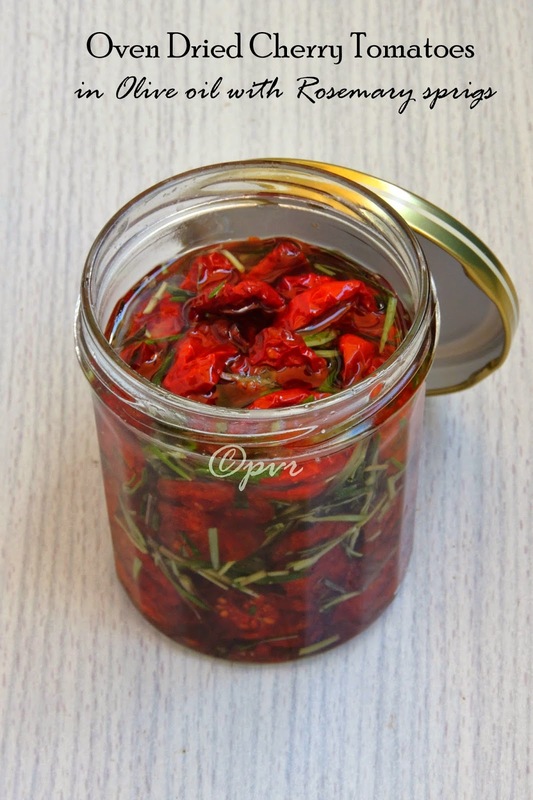 Obviously this method is absolutely interesting to get your rosemary infused dried tomatoes as well as rosemary infused oil.Two in one rite! !..If you dont get cherry tomatoes, you can still make with usual tomatoes, just slice them as two and proceed. Now arrange the sliced tomatoes with cut side up, sprinkle salt on the top. Bake them in middle rack for 3hours. Once the cherry tomatoes gets completely dried, let them sit in room temperature for two hours until they gets cool completely. Take them in an air tightened bottle with chopped rosemary sprigs, pour in the olive oil until the dried tomatoes gets covered. Close it tightly and keep aside. Dont disturb them atleast for a week or two before using them. Very useful post,thxs for sharing!! a great way to save the goodness of summer! They are just amazing. The pictures are perfect. I have no Doubt abt the taste of those oven dried tomatoes. These look so much better than the store brought ones.. lovely clicks.. 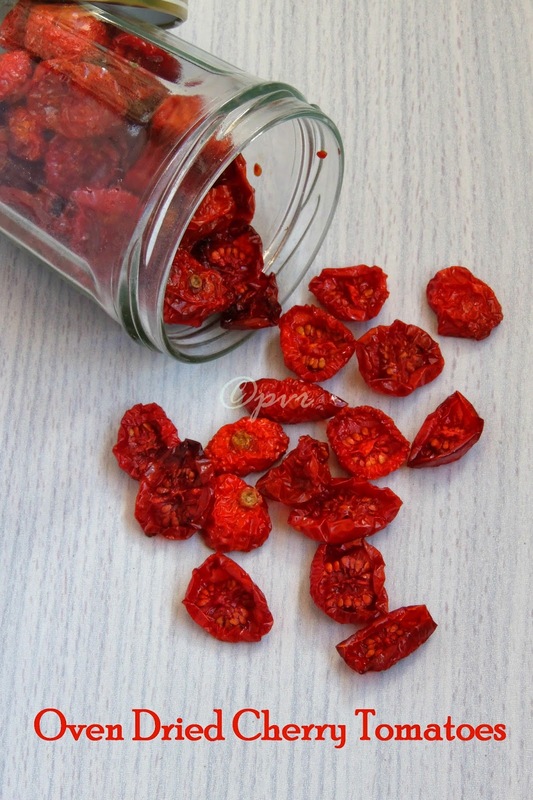 The oven dried tomatoes truly look good. I guess I could eat them plain. And when you see them in that bottle, the effort is totally worth it. I like the tangy flavor in tomatoes,can eat as it..ore,Italian treat ah akka..super..